Love cooking with your kids? These two easy no bake desserts for kids are no fail and perfect for kids to make with just a bit of help from mom or dad. 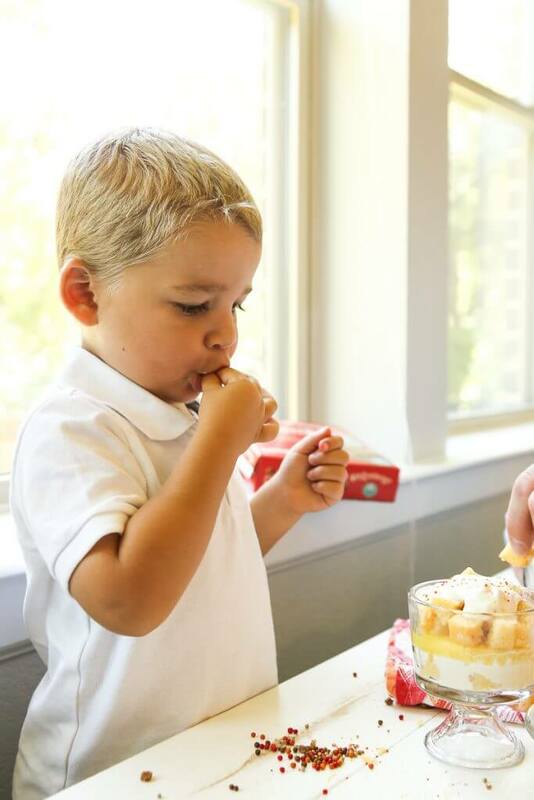 Choose from the easy citrus parfait or the apple crumble parfait for a delicious dessert your kids will love, especially since they made it! And best of all, they both use fresh fruit, making it a simple way to get kids to eat fruit! Lately my 3-year-old has been getting pickier and pickier with what he’ll actually eat. He’s always been a little picky but lately it’s gotten even worse. The one thing I’ve found that really helps is when he gets to “cook” his own food. 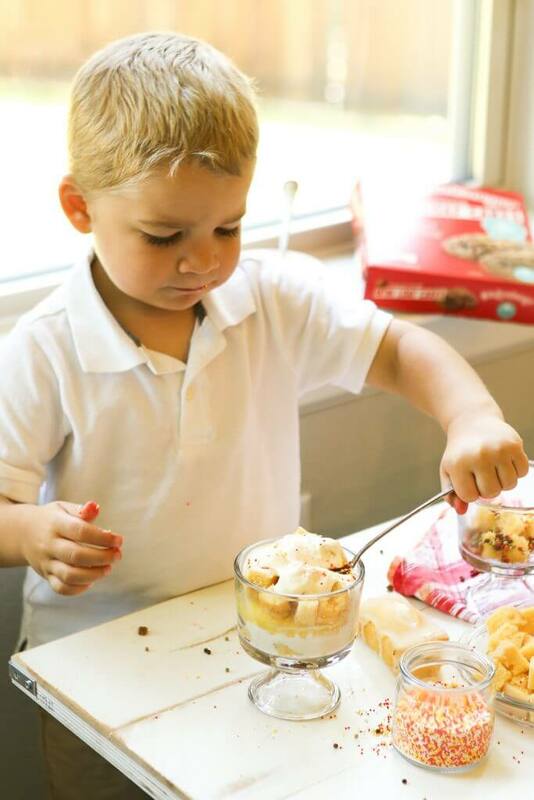 Last week we made these mini pumpkin pizzas and this week I put together a fun little make your own dessert parfait bar for him as a fun after school snack. And normally he won’t touch “white stuff” or cake because he doesn’t like cake. But this time, he not only tried everything, he declared everything yummy. So yummy actually. 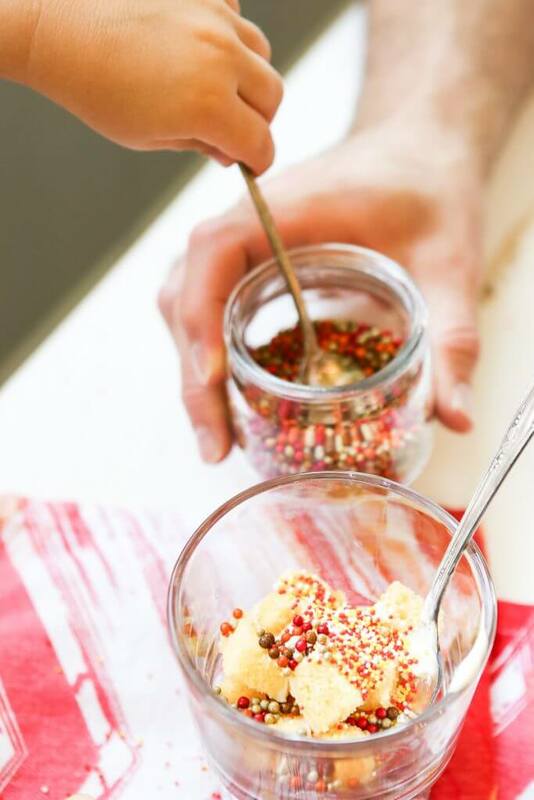 Parfaits are the perfect no bake desserts for kids because you really can’t mess them up. I cut up some Otis Spunkmeyer iced lemon and cinnamon crumb mini loaf cakes into small cubes to use as the base. 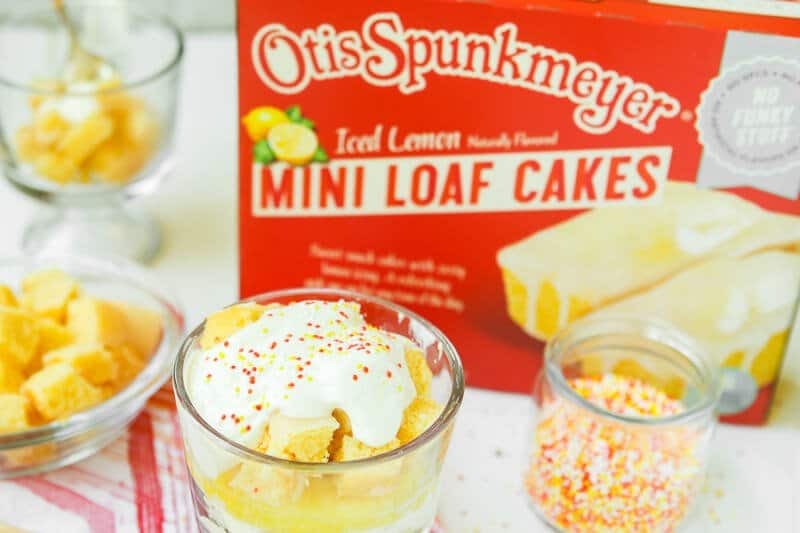 The Otis Spunkmeyer mini loaf cakes are perfect because not only are they delicious, they’re part of the new Otis Spunkmeyer no funky stuff line of snack foods that are free of anything funky – artificial coloring, artificial flavorings, high fructose corn syrup, partially hydrogenated oils. And they seriously taste homemade, it’s no wonder my son loves them. 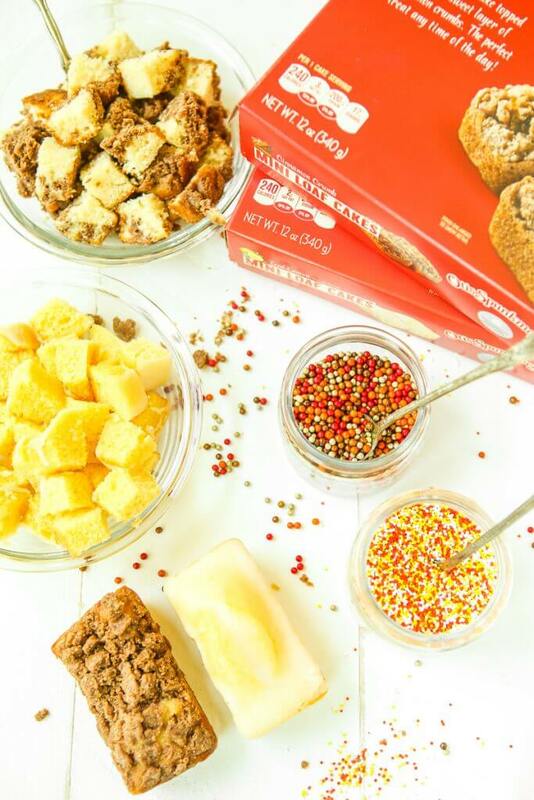 You can get the new no funky stuff snack cakes across the country at Walmart or via Amazon Fresh if you’re lucky enough to have it available to you. Anyway, start by cutting up a bunch of those. We used little parfait glasses and one individual loaf cut into cubes was perfect for the bottom layer of the parfait. 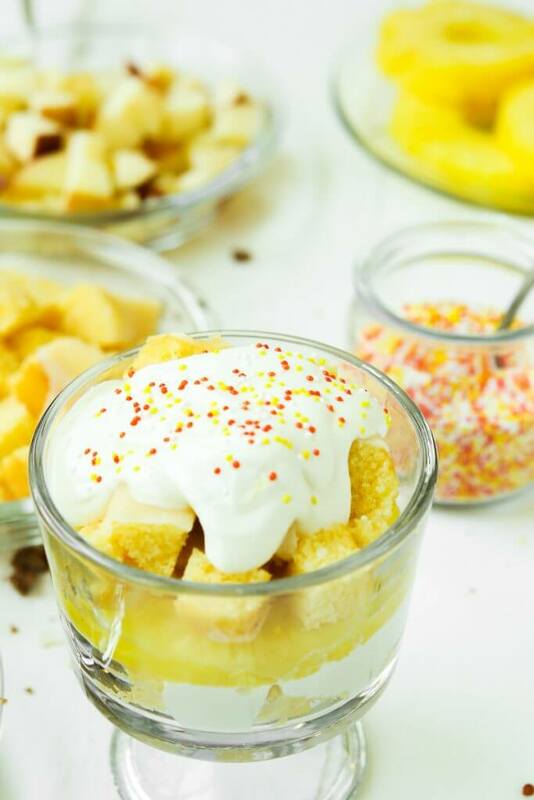 Then I cut up fresh pineapple and apples, made up a citrus whipped cream (recipe below), and pulled out the sprinkles to give my son plenty of options for creating his own perfect parfait. 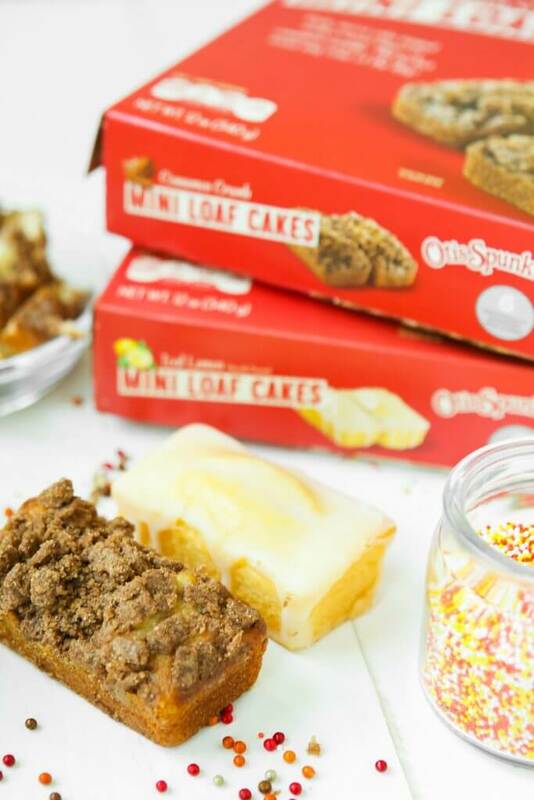 What would you make with Otis Spunkmeyer sweets? 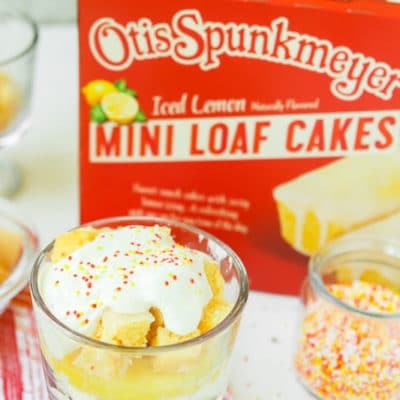 Go pick out your favorite Otis Spunkmeyer sweets (find where to buy them here) then post your original recipe or hack idea on social media. Use the hashtag #OtisSnackHack and tag Otis Spunkmeyer and @playpartyplan so I can see the idea. I’ll be working with Otis Spunkmeyer to choose our favorite and the winner receives a $250 Visa gift card! You get a yummy snack and the chance to win big! 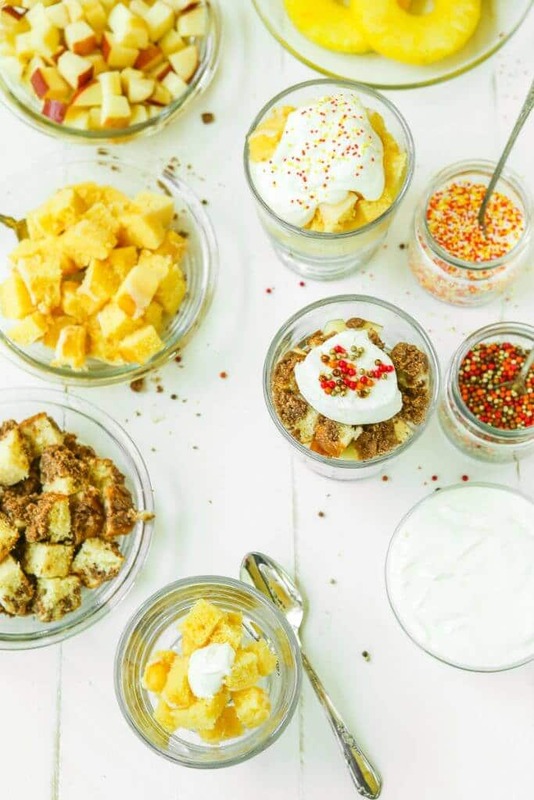 Simple parfaits made with lemon cake, pineapple, and a fresh citrus whipped cream! Cut iced lemon mini loaf cakes in half then cut into small 1/4 inch cubes. Mix whipped cream with 1 Tbs pineapple juice and 1 Tbs orange juice to make citrus whipped cream, or leave plain if you'd prefer. 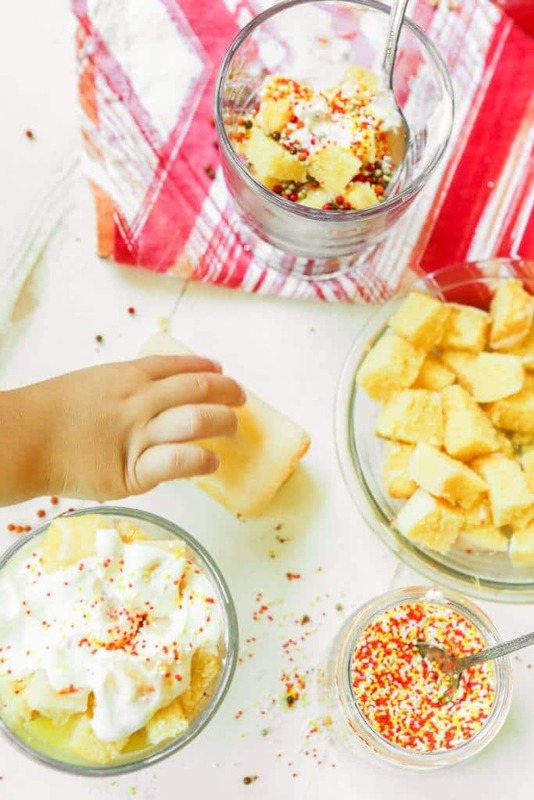 To create parfait, start with a layer of lemon loaf cubes, top with whipped cream, top with a pineapple ring or chopped pineapple, and finish it off with more whipped cream and sprinkles. Cut cinnamon crumb mini loaf cakes in half then cut into small 1/4 inch cubes, keeping the bottom half separate from the top crumb half. 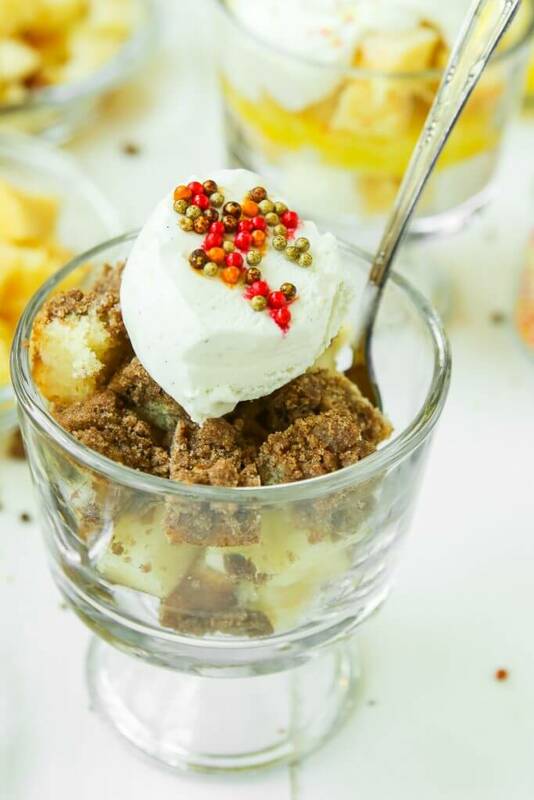 To create parfait, start with a layer of the bottom (non-crumb) loaf cubes, add chopped apples, top with the crumb loaf cubes, and finish it off with vanilla ice cream an sprinkles. Recipe written for 1 parfait, multiply by however many parfaits you need to make more. Wow! These look awesome! We love Otis Spunkmeyer so this is something that is right up our alley! My young daughters love to help bake and get upset when they cannot use the oven, so these are great no bake options! I have bookmarked this! Thank you! So many wonderful ideas here! Not just for kids but adults who need a quick treat as well. When I was younger my mother made a lot of no-bake desserts. Growing up in Oklahoma, you had to because you could never turn the oven on in the summer! Omg my it looks so delicious. He did an awesome job. I have picky eaters to and I find sometimes cooking with them helps. 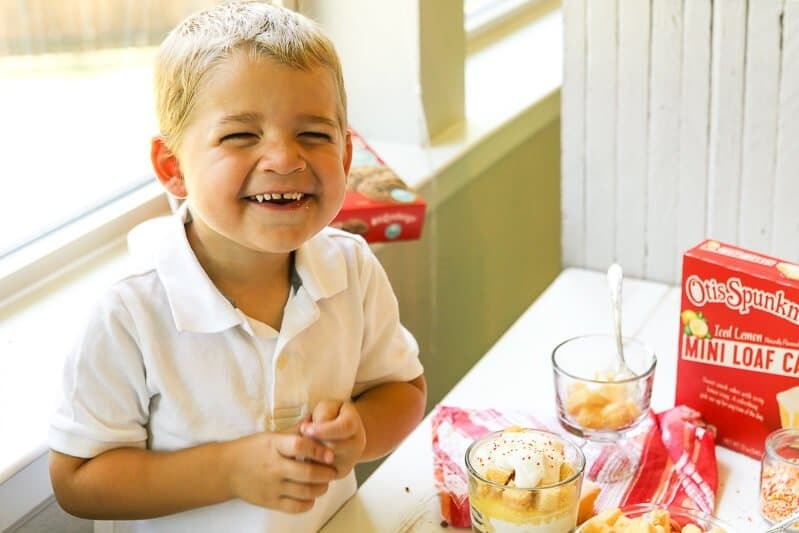 These easy no bake desserts citrus or apple crumble parfaits are great ideas for kids to make. I know my niece’s kids would love either of these parfaits and I will have to make them both with them. Thanks for sharing the awesome dessert ideas and the recipes. 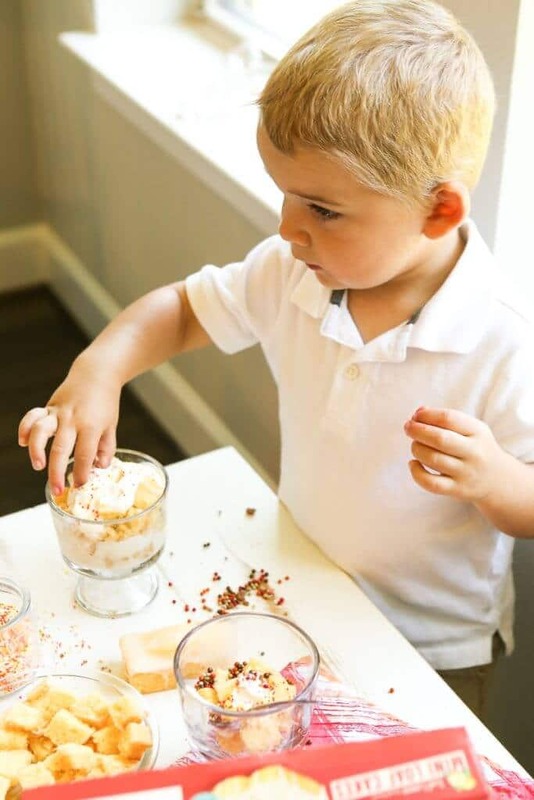 What a good ideas, my two boys would love the No bake desserts and they would enjoy it. These no bake desserts look amazing!!! I know my kids would love them as well, great way to use those mini loafs. wow that looks really good.I don’t think I have ever tried that brand before but now I think I will have to look for it at my local store. I love no bake desserts! These treats look so good. I might have to pick some of these up so that I can make them for my kids. They love eating dessert but it is a rare treat in my house. My son will surely wants to make these desserts. He likes to help me in the kitchen. Parfaits are one of my favorite things to eat! I love that you can make them in pretty much any combination that you want! 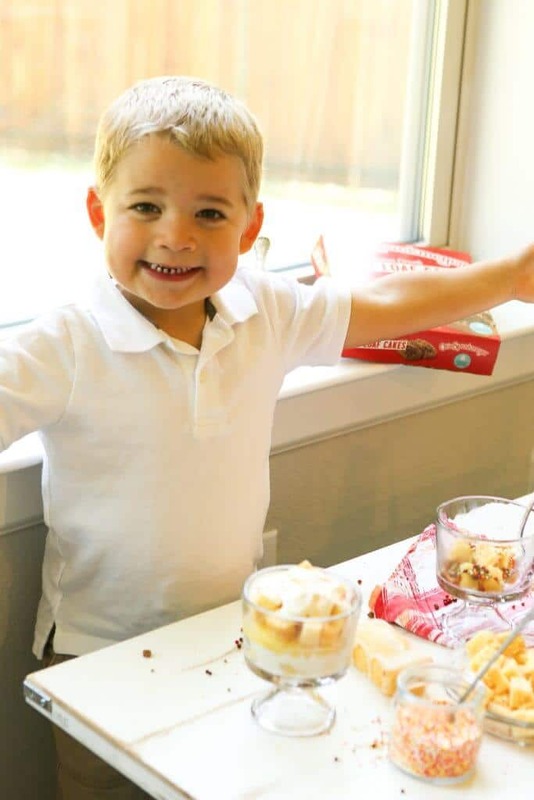 We love getting our kids involved in the kitchen and when it’s dessert, it’s even easier! These look sooo good! I love how easy they are to make too! Yum, definitely making these soon!